In this eighth-grade humanities lesson, students make fresh spring rolls and create their own dipping sauces. Students practice their knife skills while preparing a variety of seasonal vegetables for the spring roll filling; they hone their tasting skills and practice collaboration by working in small teams to create their own dipping sauce recipes; and they build independence and teamwork by tracking and managing the group’s timing throughout class. Identify and perform a variety of cutting techniques for a variety of vegetables. Create and adjust a recipe according to taste. Prepare a meal as a group while managing their time without adult help. Prepare a variety of vegetables as spring roll fillings using a variety of cutting techniques that they identify without direct instruction. Create their own dipping sauce recipes from a variety of optional ingredients according to taste. Manage their own timing in collectively preparing the meal. Welcome students and review today's recipe. Explain that today we'll continue to focus on the independence and seasonality in the kitchen through making fresh spring rolls and dipping sauces to accompany them. Introduce some of the ingredients we'll be using to make the spring rolls, noting that all the vegetables we'll be using are currently in season. Have students guess what the rice paper wrappers and vermicelli or mung bean noodles are made out of. Demonstrate how both turn soft when soaked in warm water. Introduce the sauce table setup and explain that the focus of this station is to practice honing your tasting skills to create a delicious dipping sauce for the spring rolls. This will require a close attention to the flavor of each ingredient and discretion about which ones to include and in what proportions to balance the overall flavor of the sauce. Because they'll be working in small groups, note that this job will also require a high level of collaboration and potentially involve compromise. Demonstrate how to taste the sauce ingredients in a hygienic way. As a final challenge to the students, each group will be in charge of managing their own time during this lesson. This means that the teacher will not be telling the group that it is time to clean up or reminding them to set the table. Instead, the group will be responsible for tracking time themselves, and managing the tasks so that everything gets done in time to eat. Students organize themselves in groups, work on a timeline, and roll their own spring rolls. Small-group check-in: What is your favorite kind of roll or wrap? If you could teach any skill or class, what would it be? Explain that today students will separate themselves into two groups—one to prepare the fillings for the spring rolls, and one to prepare our dipping sauces. Students in each group will distribute work among themselves. As a table we'll make two dipping sauces, and every person will have a chance to roll two spring rolls with their fillings of choice. The workflow for the day will be to first prepare the vegetables and dipping sauces, then clean off the table and set up all the ingredients to assemble the rolls. We'll assemble the rolls, then clean off the table again, set it, and eat. After, we'll clean up. Explain that today, to add a further layer of independence, the group will be responsible for managing their own time. Help them come up with a timeline, working backward from when the class ends to figure out when they'll have to start cleaning up, when they'll have to be ready to eat, and when they'll have to have finished preparing all the vegetables. Turn it over to the students to organize into groups by recipe. Once the groups are decided, have a student from each group volunteer to act as timekeeper. Set the table and eat. While eating, have the sauce group share what ingredients went into their sauces. Brainstorm other foods that might taste good with the sauces, other sauces that might be good with the spring rolls, or other ingredients that would be good in the spring rolls. What skills do you think you learn at school? What skills don't you learn at school? What skills do you learn in the kitchen in addition to cooking? What skills do you think you need to live and work independently? Is there an area in your life that you feel very independent in? If there is time, have students share other ingredients they could add to spring rolls. Alternately, have students share a skill they think they need to live and work independently. Because our focus with this lesson was on building independence in the kitchen, we elected not to provide a sauce recipe. Instead, we took this as an opportunity for students to practice their tasting skills and creativity. In order to create enough physical space for multiple groups to be working with the variety of sauce ingredients, we pulled out a separate table and set up a sauce station. In addition to the ingredients, we put two cutting boards with knives, a microplane (grater/zester), and a damp towel for wiping down the knives next to the garlic, ginger, lemons, and limes. This allowed students to prepare these ingredients at the table without having to take the ingredients elsewhere in the room or walk through the room carrying sharp knives. In order to encourage students to taste ingredients as they went in a hygienic way, we put all the liquid ingredients into small dropper bottles (soy sauce, rice vinegar, black vinegar, sesame oil). We also provided coffee stirrers as tasting sticks for the thicker ingredients (plum sauce, hoisin sauce, sriracha, sambal, tahini, and bean sauce). Depending on the skill level of the group, you may either want to demonstrate how to assemble a spring roll before having the students roll their own, or have a student demonstrate based on the recipe instructions. Generally, some form of demonstration makes the rolling process much smoother and the rolls themselves much more successful. The most common pitfall that we observed in spring roll assembly was in soaking the rice paper wrappers too long—if the wrappers get too soggy, then they rip very easily. Encourage students to use moderation in adding ingredients so they don't end up with a roll that is overfull. Purple noodles: Our students were delighted to discover that adding sliced purple cabbage to the noodles turned them purple. Spring roll variations: Many students will be excited and thinking about imperial rolls, egg rolls, or other deep-fried types of roll. Note that the process of making those is similar except for using a wheat-based wrapper and frying before eating. Leftover fillings: Most classes had a fair amount of fillings left over after students had made their rolls. We mixed these leftovers in a single bowl with a simple dressing and enjoyed as a side salad with our rolls. Sprouting mung beans: Although we didn't sprout mung beans for this lesson, it would be an excellent opportunity to do so with students. 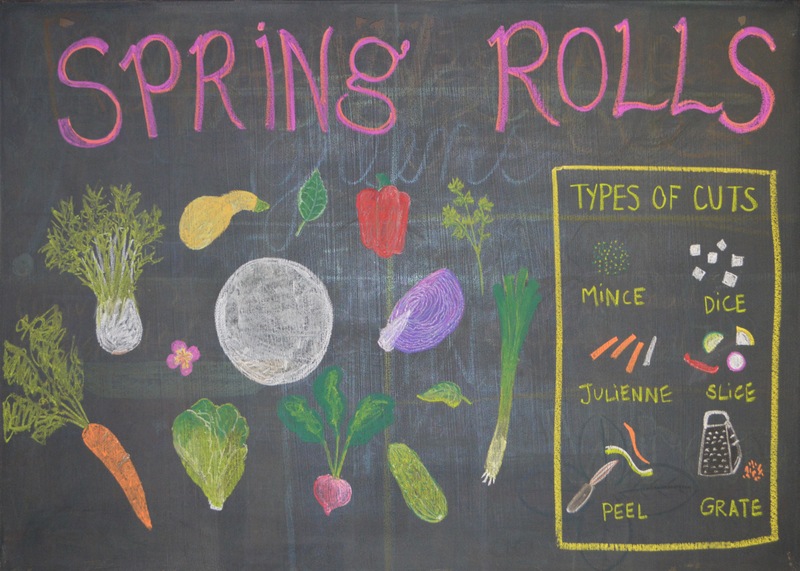 Students should start the sprouting process at least four days before they plan to make the rolls.